This week, I have been attending scholarly meetings and a seminar at my new university, and thus I have had to travel within Mexico City. I did not drive (I know it’s insanity to drive in Mexico City), so I’ve been taking the Metro, a few buses and almost everywhere, taxi cabs. 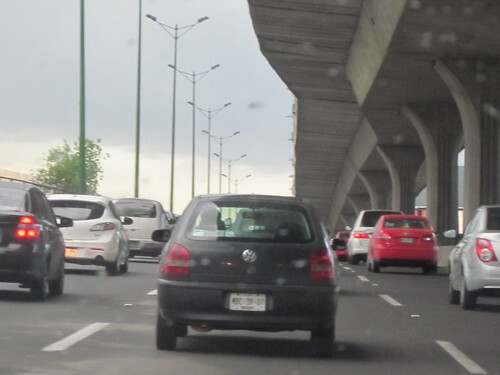 While I do remember that Mexico City has always had a congestion problem, I doubt it is anything like I experienced this week (and I’m told next week, when students come back to school, it will be even worse). I saw entire fast lanes completely stopped to an absolute halt. I have been told that you don’t schedule meetings in Mexico City and then attempt to go back to your office. This is completely unheard of for me, if you think about it. Mexico City has an amazing public transportation system in that it covers almost every place within the city, but there are so many issues with construction (the Mexico City government is building “second floors” all over the place in hopes to ease traffic and congestion) that it is almost impossible to schedule 2 meetings in a day. Vancouver may have lots of flaws in its transportation system, but this week, I have missed being able to walk everywhere within the Mount Pleasant area, to bus only for a mere 30 minutes and be at my office downtown at The Network Hub, or to bus 45mins to 1 hour and be at UBC. Here, I have spent anywhere from 3 to 7 hours a day commuting. This is unbelievable, seriously. Yes, I know what you mean. I have friends who have had to spend 5 hours per day, every workday, to commute! It’s difficult to make definite times for meeting socially. As you can imagine, being a transportation planner I’m reading this with great interest. With regards to personal experiences, the closest I’ve directly observed what you’re describing is probably either Bangkok or Manila (although to be fair, I landed at the airport doing a monsoon). I’ll admin to not knowing the slightest thing about Mexico City, but based solely what you’re describing — congestion and trying to infrastructure one’s self out of it, unreliable (bordering on intolerable) travel times — it sounds like a sticky, wicked travel capacity problem. I hear their bike share has done pretty well… had a chance to try it at all? Though I suppose for the distances you are travelling (or temperatures) it’s not on your way? I absolutely love reading about Mexico through your eyes. I would really like to visit Mexico City, despite what sounds like horrid traffic and congestion problems. What is it like being in one of the most urban cities in the world? The food is great, the culture rich, the landscape absolutely beautiful. Simply crossing it off our travel list is a loss for everyone. I love Mexico!